An American Airlines flight flying out of Miami International Airport, which was headed for New York’s John F Kennedy Airport, was grounded on the 22nd of March 2017, as a swarm of bees attached themselves to one of the planes wings, forcing the flight to be delayed for hours. 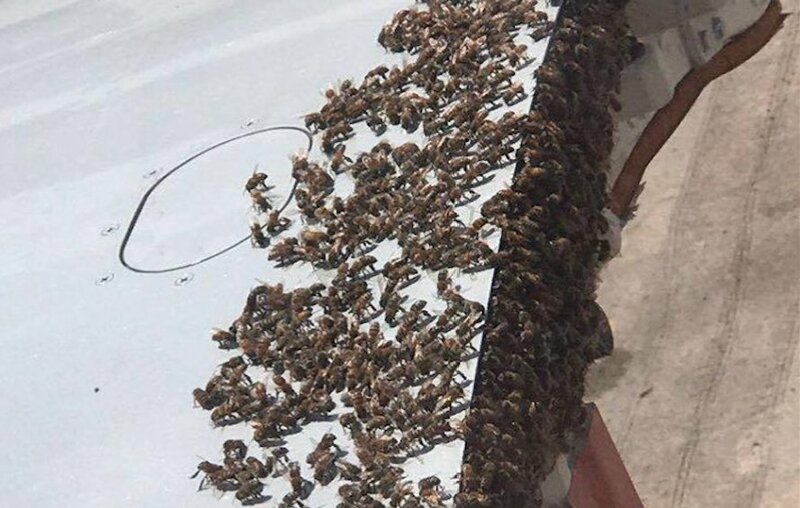 The airline was forced to force a halt to the flight because of the the danger of the bees being sucked into the airplanes engines, plus the danger to baggage handlers and airplane maintenance staff, who could be in danger of getting stung. In order to safely remove the bees from the cargo hold area, airline officials reported the incident to Miami Dade County. After several hours, the city sent a beekeeper to assess the situation and carefully remove the bees from the aircraft. Gillinski said he heard the beekeeper got stung “several times” in the process. The airline said the beekeeper took longer than usual to arrive at the airport, thus resulting in a four-hour flight delay. “We brought [passengers] gate-side amenitites — snacks and drinks — to feed them while they took care of the bee situation,” Aran Coello said. While some argued the plane should have just taken off with the bees attached, Aran Coello explained that is not protocol and could have put people at risk. “You want to nip it in the bud as soon as you see it,” she added. Despite the delay, Gillinski said most passengers were good sports. “Everybody requested free honey,” he joked. *Varies on a case by case basis. ©2014 - 2017 All rights reserved. bestflightdelaycompensation.com is a trading style of Best Flight Delay Compensation Limited.